IN THE FALL OF 1740, a farmer near Hartford, Connecticut, heard life-changing news. Nathan Cole was a conventionally religious man whose conscience had been increasingly troubled by an unmet need for God. The news was that the young revivalist George Whitefield would be preaching twelve miles away in Middletown. Immediately, as Cole later wrote, “I . . . ran to my pasture for my horse with all my might,” and with his wife hastened to Middletown “as if we were fleeing for our lives.” They arrived just in time to see Whitefield mount the scaffold that had been erected for his sermon. To Nathan Cole the young British evangelist “lookt almost angelical.” But it was Whitefield’s message that changed his life: “My hearing him preach gave me a heart wound; by Gods blessing my old Foundation was broken up, and I saw that my righteousness would not save me.” After several more months, Cole was confident that he had been reconciled to a gracious God. Nathan Cole and his wife were among the thousands who thrilled to the message of George Whitefield at the high-water mark of America’s Great Awakening. But the roots of this revival extended deep in time before Whitefield, and its fruits could be observed for generations. First stirrings occurred during the early decades of the eighteenth century. Preaching aimed at “awakening” the spiritually sluggish or “harvesting” those with a new interest in God’s grace took place in New England Congregational churches, in Dutch Reformed congregations in New Jersey, and among scattered Presbyterians in Pennsylvania and New Jersey. 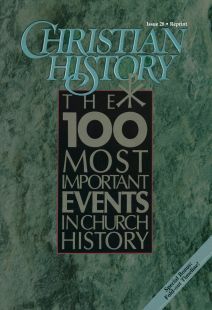 Solomon Stoddard (grandfather and predecessor of Jonathan Edwards as minister in Northampton, Massachusetts), Theodore Frelinghuysen (a Dutch minister trained by Continental Pietists), and several members of the Tennent family (Presbyterian immigrants from Northern Ireland) were the pioneers of this work. Then, in the mid-1730s, the Northampton congregation that Edwards had inherited from his grandfather was deeply stirred by Edwards’ dramatic preaching on justification by faith. His account of this stirring, A Faithful Narrative of the Surprising Work of God in the Conversion of Many Hundred Souls in Northampton (1737) was read widely in America and the British Isles and stimulated other ministers to look for similar renewal in their congregations. General revival, however, awaited the arrival of Whitefield. This young Anglican had been a colleague of John and Charles Wesley and had already experimented with preaching out-of-doors in Britain. His nominal reason for being in America was to supervise an orphanage in Georgia. His real reason was to preach. A person of nearly overpowering charisma, Whitefield also intuited something about the changing circumstances of his day. Whitefield’s dramatic appeal to individuals represented a Christian adaptation of the old gospel to the kind of free market that was speedily developing in trade and ideas. It was to the individual (not as positioned in a traditional hierarchy, not as bound by family constraints, not as member of a local congregation) that Whitefield made his appeal. Whitefield preached more than fifteen thousand sermons in his thirty-five-year career as an itinerant, but none were more effective than in 1740. On a New England preaching circuit in the fall of that year, when he was heard by Nathan Cole and his wife, Whitefield addressed crowds of up to eight thousand people nearly every day for over a month. That tour may have been the most sensational event in the history of American religion. In his wake Whitefield left thousands asking “What must I do to be saved?” He also left some of the colonies’ leaders wondering what such religious “enthusiasm” would do to the social fabric, and not a few ministers dismayed about this radical new approach. The attacks that eventually rose against Whitefield and his message led to lingering disputes. But they also prompted careful, discriminating defenses of awakened piety from Jonathan Edwards. Edwards’ defense of the Awakening’s revivalistic Calvinism became a major component of the theological work that sets him apart as America’s most powerful Christian theologian. Revivals like those promoted by Whitefield and defended by Edwards soon spread throughout the colonies. Some, like awakenings under Henry Alline in the Canadian Maritimes, rejected the Calvinism that had undergirded Whitefield’s message. Others, like those encouraged by Isaac Backus in New England and Shubal Stearns in North Carolina, were led by Baptists, a group that grew in great numbers as a result of the Awakening. Still other currents of renewal helped prepare the way for the later expansion of the Methodists. Dr. Mark A. Noll is professor of history at Wheaton College in Wheaton, Illinois, and a member of the advisory board of Christian History. In an epochal council, the Catholic Church undertook its most searching self-examination ever and renewed itself for a modern world. A Baptist preacher had a dream that guided one of the most profound social movements of our times. The finger of God evidenced in a spirit of love.